(CNN) -- Liverpool continued their remarkable recent form with a 5-0 rout of Aston Villa at Anfield on Sunday which takes them to within a point of faltering Premier League leaders Manchester United. 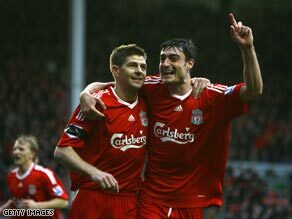 Gerrard (left) and Riera enjoyed superb afternoons at Anfield as Villa were routed. Liverpool have scored 13 goals in their last three matches, beating Real Madrid 4-0 in the Champions League, United 4-1 last weekend at Old Trafford and now the latest demolition of fifth-placed Villa. Dirk Kuyt put them ahead in the eighth minute as he reacted quickly to fire home with Albert Riera scoring a superb second just after the half hour mark. He latched on to a Pepe Reina clearance and scored with a first time half volley. Captain Steven Gerrard made sure of victory with a hat-trick, scoring penalties in the 39th and 65th minutes with a 50th minute goal from a free kick sandwiched between. Riera was involved in the first penalty as he was tripped in the area by Nigel Reo-Coker. Gerrard put Liverpool four up as he smashed the ball home following a clever short pass by Xabi Alonso. Villa ended the game with 10 men after goalkeeper Brad Friedel was sent off for pulling down Fernando Torres, Gerrard converting the subsequent penalty for his third. The England midfielder was delighted by his first Premier League hat-trick and the margin of victory. "It was more than we expected," he told Sky Sports. "We would have settled for a 1-0 win today because Villa are a terrific side." Gerrard said his team would keep up their relentless pursuit of United, who crashed to a second straight defeat at Fulham on Saturday. "We'll keep piling that pressure on them because while they go into games knowing we will pounce on any mistake it will make it more difficult for them." By contrast to Liverpool, Villa are enduring a miserable run and remain three points behind Arsenal in the race for the fourth Champions League spot. Leaders Manchester United have 65 points from 29 games with Liverpool on 64 having played a game more but now with a superior goal difference. Chelsea are on 61 from 30 games having missed a chance to close up by losing 1-0 to Tottenham Hotspur on Saturday. In other Premier League games on Sunday, Manchester City continued their fine home form with a 1-0 win over relegation strugglers Sunderland. Robinho saw a first half penalty saved but Micah Richards spared his blushes with a 50th minute goal. Wigan moved up to seventh with a 1-0 home win over Hull City who are slipping into relegation trouble. Ben Watson scored the winner for Wigan with six minutes remaining.